Hello and Merry Christmas. I hope that you have a wonderful day filled with much love and laughter. Australia had just finished celebrating Christmas when this post goes live, but our family is actually delaying our Christmas celebrations until Sunday, when my sister and her family arrive (they couldn’t make it Christmas Day). My Mum and Dad have already arrived, as has my eldest sister and her husband, so it has been lovely having a house full. My kids have been very patient and can’t wait for their cousins to arrive. I love having all my family altogether. 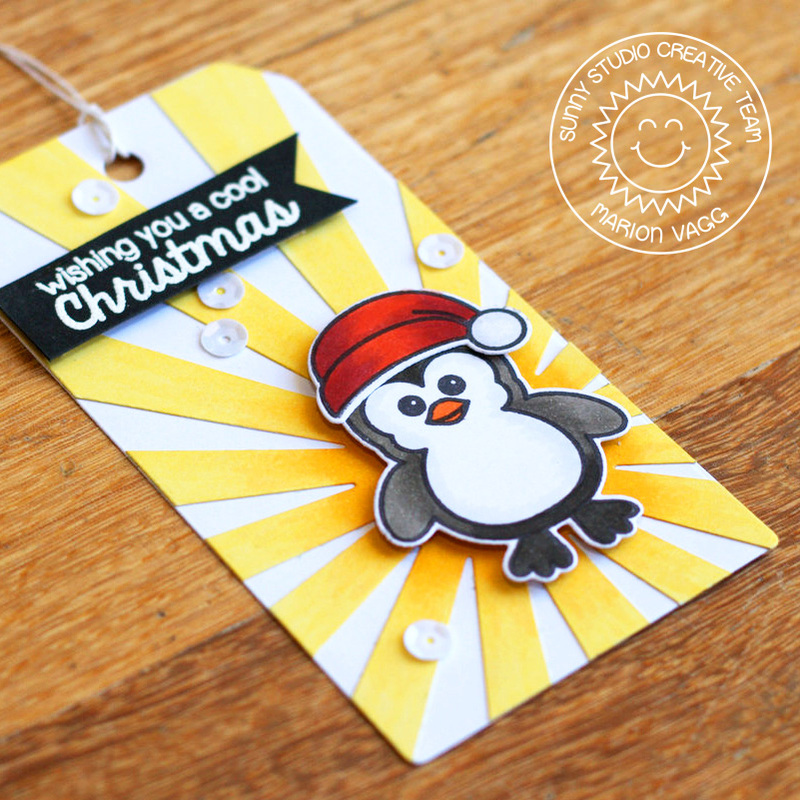 Anyway, I have a Sunny Studio tag to share with you using the Bundled Up stamp set and its co-ordinating dies. 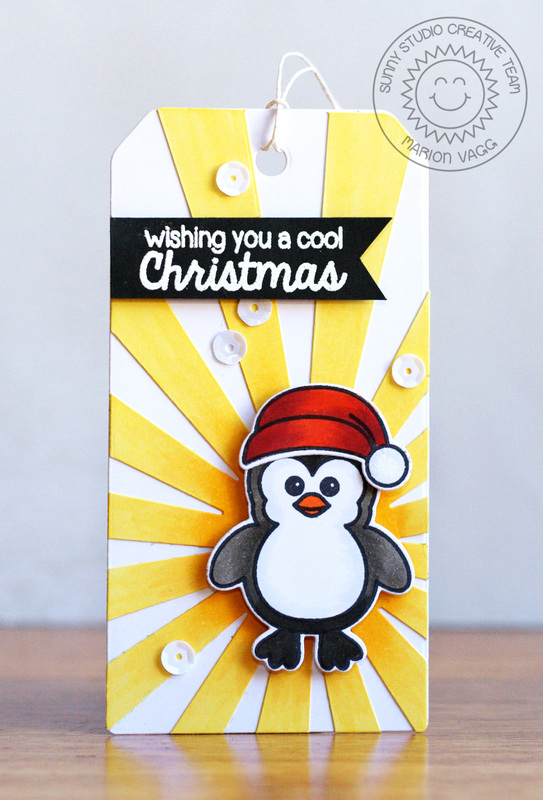 The penguin was coloured with Copic Markers as are the sun rays, which is a Simon Says Stamp die. I’ll add the supplies list later. If you celebrate Christmas, what did you get up to? Good evening (or morning depending on where you live!) 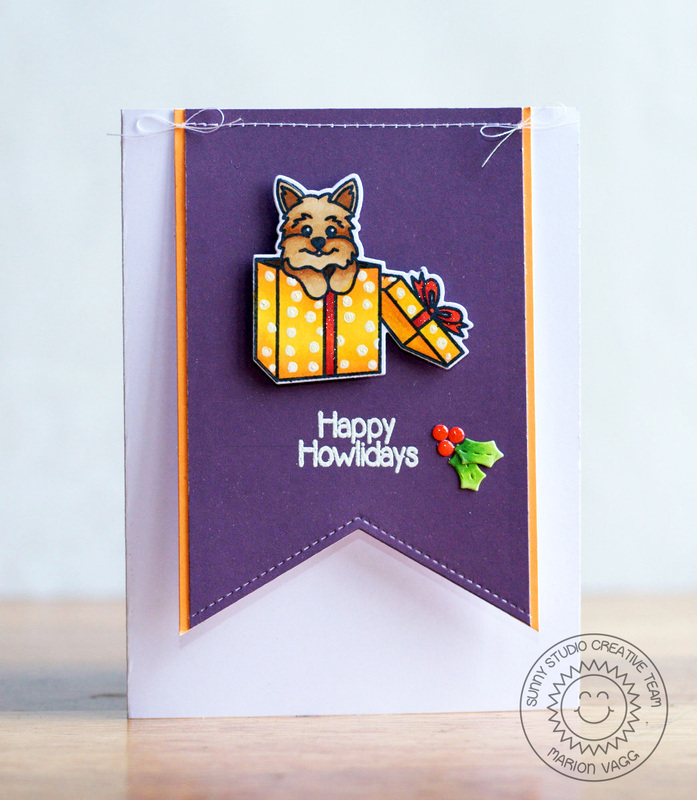 I have another Sunny Studio card to share with you which uses the Santa’s Helpers stamp set, the coordinating dies and the popular Fishtail Banners dies. All the images are coloured with Copic Markers and I attached the banner to the card front with my sewing machine. 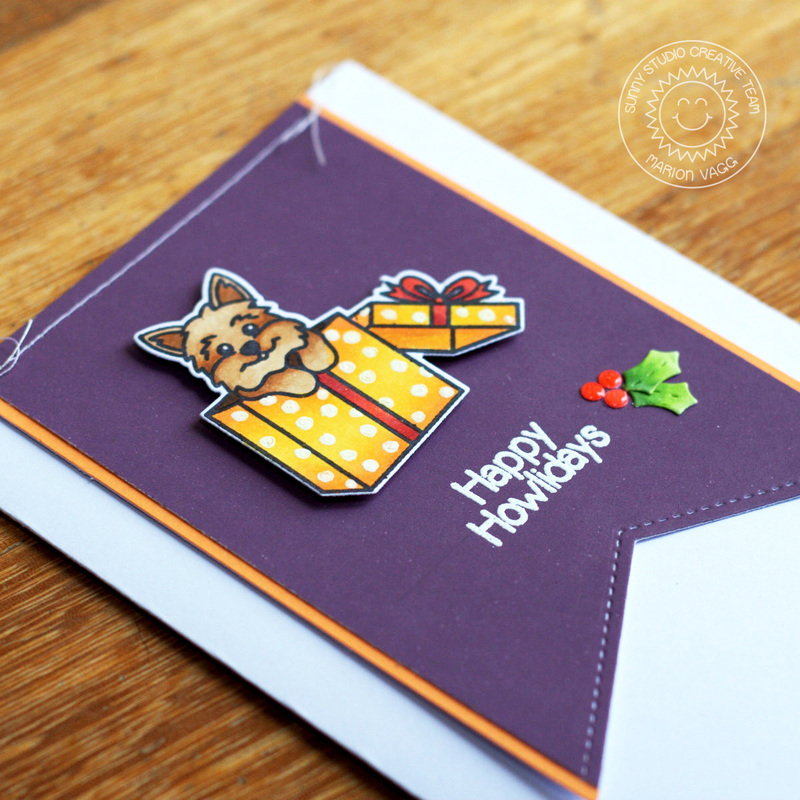 A great Christmas stamp set for any animal lover! Short and sweet from me tonight. Have a great night (or day). I’m off to bed! 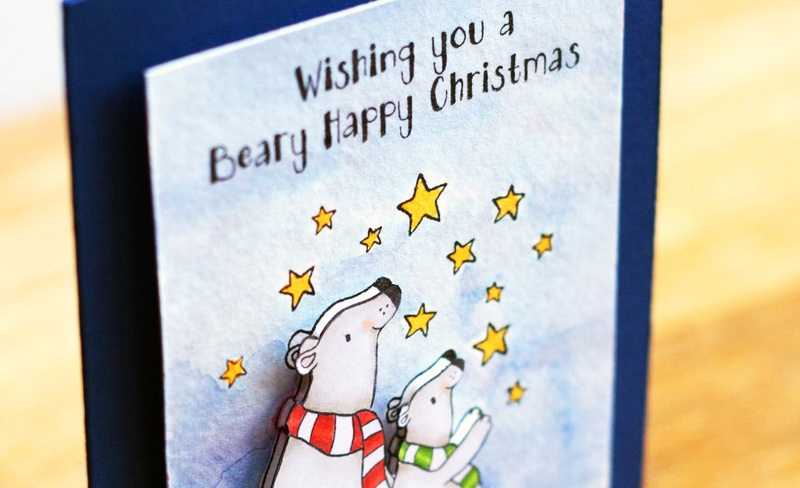 I’m back with a sneak peek of a Christmas card that I have over on the Penny Black Simplicity at its Best blog. To see the whole card with instructions, you will need to head here. Hello. Today I have a Jane’s Doodles card to share with you that went up on the Jane’s Doodles blog last week. 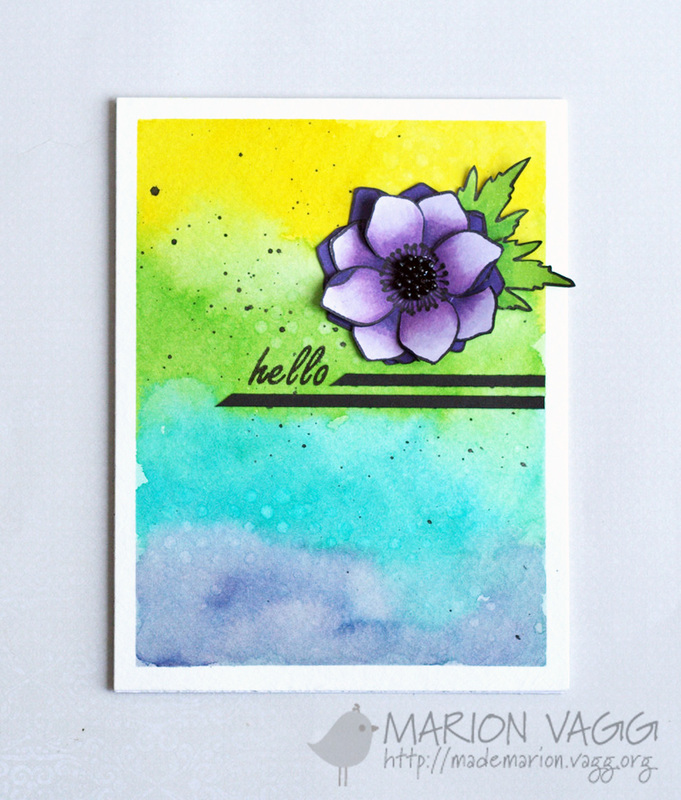 I felt like getting all inky and artsy and so after playing around with some distress inks, this card happened. I’m not usually a fan of purple, but it just felt like the right flower colour for the background. The background was water coloured with Distress inks – Mustard seed, Mowed Lawn, Peacock Feathers and Chipped Sapphire. I then took a Penny Black stencil and dabbed up some of the colour with a baby wipe to create the subtle spots. The flower, from the Anemone stamp set, was coloured with Copic markers and I clustered some black seed beads in the centre and adhered them with Glossy Accents. 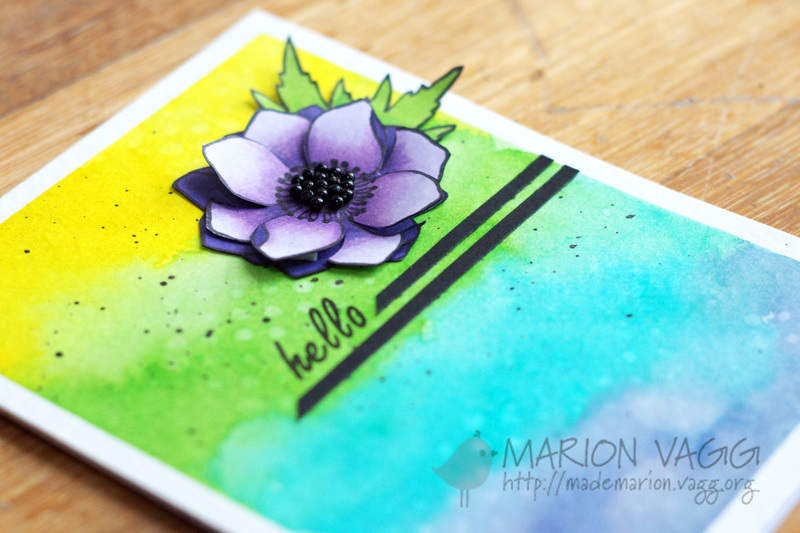 I finished the card of with some black ink splatters. Ink: Memento – Tuxedo Black ink, VersaFine – Onyx black ink, Distress Ink – Mustard seed, Mowed Lawn, Peacock Feathers and Chipped Sapphire. I hope all your Christmas preparations are coming together. My husband and I have been doing heaps of gardening, getting ready for all of my family to start arriving next week. The garden is looking good but I managed to stub my little toe on a retaining wall, and have a managed to crack the bone! I have one very tender, large and purple toe!